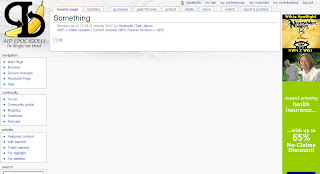 Originally created as a tribute to the Greatest Website in the World, something.com, this was a companion article to the Example page. Indeed, the best revision of the page dates back to its creation on the second day of Illogicopedia's existence (existance? ), making it one of the very first pages to grace the hallowed pages of Illogia. You could argue that putting anything here would be acceptable but this is rubbish as this isn't the article for anything. It's the article for something - that is - not nothing. Or something. So, big up the greatest of the Illogicopedia thing series, the first and, some might say, the best - Something.